A young man raise the flag of Iran’s opposition, during a rally in Brussels protesting Iranian regime’s Foreign Minister visit to Brussel. On June 10th, the Kansas City Star published a commentary piece by Saeid Sajadi. 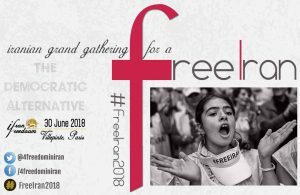 The article, entitled “Real hope for democracy in Iran, but the U.S should help”, called on the Trump administration of offer a message of support to annual gathering of the Iranians in Paris, the Free Iran-2018. Saeid Sajadi began by exploring the effect regime change in Iran would have on the wider Middle East. He called the Iranian regime, “the most destructive force affecting the stability, safety and security in the region and beyond”. The uprisings which took place at the tail end of 2017 “shook the foundation of the regime”, Sajadi said. Rather than isolated demographic groups protesting their individual grievances, the uprisings united people from all walks of Iranian society. The poor stood shoulder-to-shoulder with the urban middle class and wealthy merchants. This was a landmark moment for the regime. It had long relied on the unfettered support of the nation’s lower classes. Slogans like “death to the dictator”, and “the game is now over”, will have shaken the mullahs’ confidence. The rapid spread of civil unrest, which reached 140 cities over the span of a few days, shows two things, according to Sajadi. Firstly, it demonstrates the extent that Iranian society has been harbouring a desire for regime change. 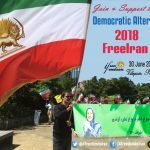 The eagerness with which people took to the streets, risking both their lives and freedom, indicates that many held deep-rooted mistrust towards the regime. The second is the strength of the MEK’s networks. Sajadi said the scale of the revolts indicates how “deeply the hidden and effective network of the main Iranian opposition force- PMOI, or the People’s Mujahedin Organisation of Iran [MEK]- is rooted throughout Iran”. What is incredible, is that the group has survived a perpetual attack on its existence by the Iranian government. Sajadi cites the massacre of 1988 when the government executed 30,000 MEK members in a single summer. Yet the group is not only still active but thriving and threatening the mullahs’ grip on power. As President-elect of the NCRI, Maryam Rajavi, predicted, 2018 has so far been a “year of uprising”. Nationwide-strikes have crippled the logistics sector. Other sectors like education, metalworks, taxi drivers, shop owners, and students have also organised protests and strikes against the regime. Unable to avoid the will of the Iranian people, the US is beginning to change its stance towards the clerical regime in Iran. On May 21st, Secretary of State, Mike Pompeo, outlined 12 areas in which the regime needed to adjust its behaviour. The demands were explicitly designed to minimise Iran’s influence as a disrupting force in the Middle East. These demands, although intended to limit Iranian power and influence, also provide support to the Iranian public. However, Sajadi argues the US should go further. With Iranians risking their lives in Iran to show the world that they want regime change, the U.S. has the opportunity to support real change in Iran. Lending its support to the Iranian people, in concrete terms, is in the interests of American people, Sajadi says. He even provides an opportunity for the US to do so. On the 30th of June, there will be an international gathering of NCRI supporters in Paris. Many Iranians living in exile, and Iranian-Americans are set to attend. Sajadi calls on President Trump to offer a message of support at this, or another event organised by the Iranian opposition, to provide solidarity to the Iranian people on their quest for regime change. 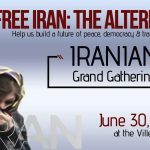 Italian Municipalities, support Free Iran 2018 Gathering in Paris. 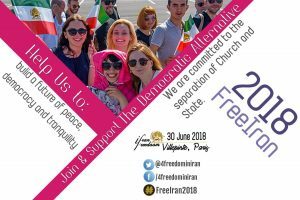 Twenty-two Italian municipalities from the Piedmont region signed a statement in support of the Free Iran rally that is scheduled for June 30th in Paris. 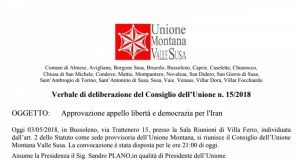 The statement was written following a regional Mayors’ council meeting in Italy’s Vale De Susa on Friday, June 1, 2018, in which the statement was discussed and approved by those in attendance. The statement is an expression of solidarity for the Iranian people and their widespread uprising against the repressive ruling regime. The uprising, which began in December 2017, took place in 140 cities across Iran for two weeks before being temporarily suppressed by the regime. The people staged their initial protests to express dissatisfaction with current economic conditions, but as the uprising spread, the people began to call for regime change and nothing less. Protests were widely publicized with the help of social media, and the international community became aware of the unrest. 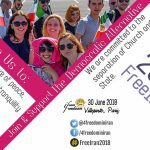 “We support NCRI’s President-elect Mrs. Maryam Rajavi’s 10-point plan, which is aimed at setting up a democratic republic based on separation of religion and government, gender, ethnic and religious equality, non-pursuing any nuclear program, abolition of death penalty, peaceful coexistence and commitment to international rules and conventions, to ensure democracy, development and progress in Iran and the world. 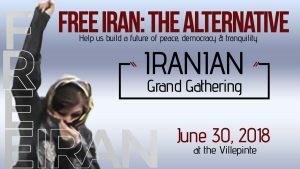 The statement went on to express support for the upcoming Free Iran Grand Gathering, which will take place in Paris on June 30th. 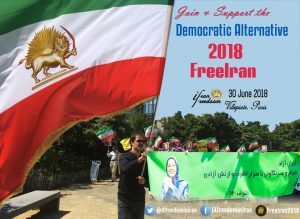 The annual event is intended to promote the resistance movement in Iran and to support the people’s desire to overthrow the oppressive theocracy currently in power and replace it with a secular democracy. “Amnesty International has regarded the massacre as a crime against humanity, calling for its perpetrators to be brought to justice. According to UN reports, the Iranian regime has the highest per capita execution rate in the world. “The Iranian people showed the world that they’re more than willing to join their organized resistance and pay the price for democratically changing the ruling dictatorship in Iran and replacing it with a system that is based on separation of religion and politics. “We hereby express our solidarity with Iranian people’s uprising for freedom and democracy and also declare our support for NCRI’s program for a democratic change in Iran. 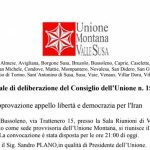 The municipalities who signed the statement were Almese, Avigliana, Borgone Susa, Brozolo, Bussoleno, Caprie, Caselette, Cianocco, Chianocco, Cusa di San Michelle, Condove, Mattie, Mompantero, Novalesa, San Didero, San Giorio di Susa, Sant’Ambrogio di Torino, Sant’Antonio di Susa, Susa, Vaie, Venaus, Villar Dora and Villar Focchiardo.